Hi friends, hi fam, hi randos who might someday happen upon this blog and hence find themselves smack in the middle of my rando life! Thanks for dropping by to check out my blabberings on travel, food, and topics completely unrelated to either of those but which I find intriguing and/or interesting and/or funny and/or delicious and/or hickish (there will probably be many of the hickish posts while I’m here in my home state of Ohio until I jet to Australia in mid-February. You’ll see what I mean when I relay stories from the police blotter in the Salem News). I know I promised many of you that I’d get this sucker up and running ASAP – ASAP was probably like a month ago. Oops. I have excuses, I swear!!! Let me start at the beginning… waaaaaaay back in early December 2007 when I called Boston home, when I ate snow for breakfast and cursed at the CT1, when Whole Foods was merely a skip and a jump away and Philari daily dodged the catcalls from the huddling mass of paparazzi loitering at the corner of Mass Ave and the SW Corridor. Oh, how my life has changed since then!!! Here's the view from my apartment in Boston. But, I get ahead of myself. Since I neglected to begin my blog when I promised, I now must suffer the punishment of submitting all of my backlogged thoughts and photos for the world to see (and laugh at). So, there will certainly be an influx of posts to this blog over the next several days. The posts will be dated today, but will really be stories from when they really happened, which will not be today, but some day before today, and I’ll try to make it clear which day you’re supposed to imagine you’re in, which will not likely be from this year, but from the last year which is the year which ended when the current year began and I found myself here in Ohio where I am parked for the coming days (which will also be covered in this post, but not today). So as you can see, there will be a fair bit of thought involved on your part if you’d like to live viCARIously through this so blog don’t think you can just sit back and drink a dirty vodka martini straight up with extra olives and passively browse through my posts! Stop being lazy and make me a martini, too! Ok, I’ll stop with my crazy talk and not-so-quickly cover my last week or so in Boston. Looks like this is going to be my first ever Super Post (not to be mistaken with this Super Post) and will probably turn into a multi-segmented post. Much in the same way I use my birthday as an excuse to have multiple celebrations over the span of at least two weeks (a la Jackie Donahue), I used my planned December 20th departure from Boston as an excuse to spend too much money eating at restaurants on my “definitely must eat at before I leave Boston” list, to have and attend parties, and to go to girlie sleepovers in Watertown. Actually, now that I think of it, that sounds like my normal life, with or without a reason to celebrate! I also forced myself to pretend that I didn’t mind that freezing cold, icy winds, and mountainous snow dunes and subsequent melted snow/ grime puddles that accumulated ... well, just about everywhere the week before I left. I kept saying, Wow, isn’t the snow pretty! Man, I’ll miss the change of seasons! Phil, do you want to make snow angels in the yard and stick our tongues out to pretend to catch snowflakes and have a snowball fight?!! But really I was thinking,Pleeeeeeease get me out of here and send me to Australia. Pretty please? In all honesty, I had a great last few weeks in the city. I was super busy saying my goodbyes to all my favorite buddies and that made me feel all warm and tingly inside because t h at meant that I had a lot of people I loved in Boston and that just can’t be a bad thing at all. So here are some shout outs to my peeps up in that town that’s for some reason associated with beans and where people like to drop the “r” in certain words in order to affix it to the end of others (an idear that’s hahd to grasp if you’ve never been to Beantown).My boss and friend Susan M. made me cry three times – THREE! – in the span of 11 days. She made me cry more times than all of the other times I cried in the same time span combined! And of course two of those times were in front of crowds, first at my last SIF event and then at the RC holiday event, so MANY more people witnessed me cry during those two times (my rough guess is 130 folks) than ever before in my life! But that attests to how much I loved m y job of the past two years and especially the people I was fortunate to work with. The other crying episode happened when I was super bundled up with two winter hats and a scarf up to my eyeballs walking home alone in the freezing cold from our last lunch together at The Elephant Walk , so I’m pretty sure that was a solitary event with no confirmed witnesses (but now I guess you all know. Oops, I spilled the bean(town)s). 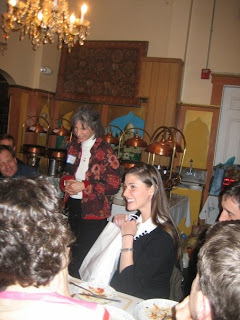 Here's Susan making me cry at our holiday work party. I didn’t spend all my time crying, though. The other Susan in my life threw a rockin’ sleepover fiesta, complete with tacos and guac and Coronas and margaritas and yes folks, refried beans! The highlight of the evening was surely dessert. Sure, there were brownies nuked in the micro topped with vanilla ice cream, but they paled in comparison to the gastronomically delightful Nerds Rope brought by Jess. Such a delicacy does actually exist and can be purchased at your friendly corner store right here in the good ole U.S. of A. All in all, itwas a night filled with good chats, great Australia advice from Betsy, and muchas calorias en mi belly. Colon closed parenthesis. On the itinerary and constantly on my mind for the weeks preceding the move was our virtual “house sale.” But, it wasn’t very fun and quite frankly stressed me (and Phil to the extent that such a chill boy can get stressed) out to no end so I choose not to talk about it here. Next topic. Philari got all spiffed up in their finest and dodged the paparazzi in order to attend the holiday party for Phil’s company, CSN Stores. It was at the Boston Children's Museum and that was fun because it meant we got to eat and drink a lot for free and play with bubbles and balls and shop in mock grocery stores with plastic lettuces. 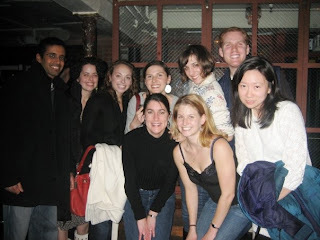 Apparently we were “reinforcing all the most important skills of scientific inquiry as [we] observed, measured, compared, discussed, and worked together to explore the world around [us]”, but I think we just got a wine buzz and played with bubbles and balls and shopped in mock grocery stores with plastic lettuces. We also got to hang out with our way cool friends Malouk and Betsi, and Ken and Carrie. My favorite part of the night was the cab ride home, Bets. ‘Nuff said. 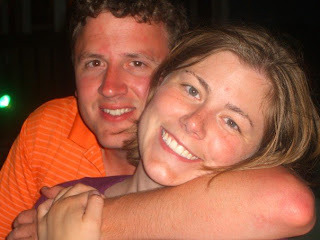 We also got to hang out with our favorite newish Boston friends, Amyand John, a few times before leaving. Man, they rock and we are so glad we met them! They love good food and especially good wine, so fittingly they had us over for a champagne brunch in their Cambridge digs. Phil helped them break in their new cast iron skillet and we whipped up some mean make-your-own omelettes accompanied by Amy’s delish poppyseed and pumpkin muffins. We also went to a cute little wine bar on Newbury Street called Piattini so Amy could impart her vast knowledge of wine to me. We ordered four wine flights of vigoroso and vibrante rossos and I must say that the wines stole the show, outshining the little plates (get it, piattini?) of food. However, I really enjoyed the Salsicca e Polenta, creamy polenta topped with sausage, caramelized onions and roasted red peppers. Hopefully some of Amy’s nose and palette rubbed off on me so I don’t go traipsing around Australian wine country making a fool of myself asking for directions to Boon’s Farm! We’re gonna miss you guys! 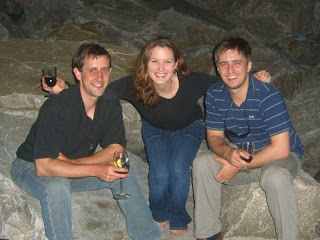 Phil with Amy & John at our wine picnic in Hull summer 2007. Well one of my oldest and bestest friends Susan (the Suz of the sleepover) and her new fiancée Scott (who meets my approval, by the way) took me and Phil to one of my favorite restaurants in Greater Boston – Tango in Arlington. Yippeeee I get excited thinking about it! It’s not so much that the food is blow me away amazing, but it holds a special place in my heart and on my palette since it’s the only place I found in New England that serves Argentine food, straight up, replete with an Argentine owner and waiters and a big bottle of chimichurri sauce on every table and A FRIDGE FULL OF QUILMES and lots of meat and even milhojas on the dessert menu. I only visited the place three times in the seven years I lived in Boston since it’s difficult to reach without a car, so my visits were spaced out by like over two years. But I chatted in Spanish with the owner Ricardo the first time I went, telling him about my year living in Mercedes, and the following two visits he immediately remembered me and Suz and offered free port and dessert to our party. So I can’t say enough about this restauro since it hits a nostalgic place in my heart and has a wonderful owner and straight up grilled meat, gaucho style. I could go on but this post is already a novel. Just go there - you won't regret it! I do want to thank Suz and Scott for a lovely evening and for hauling a big BIG load of our junk from Boston to Ohio… we couldn’t have done it without you guys, honestly, and we heart you! 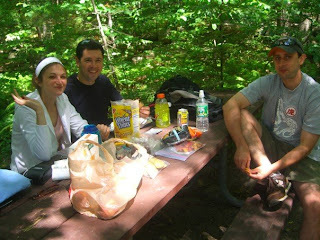 Here's Suz, Scott and Phil fueling up before our hike up Mt. Monadnock in New Hampshire this summer. On the menu were ham & cheese empanadas, peanut butter and jelly sandwiches, wheat thins, carrots, Gatorade and various fruits of the forest. We also heart our friends Matty Steins and May for throwing our official going away party at their sweet place in the South End the weekend before we left. Now, that Matty Steins knows how to throw a party. There were beverages laid out for the party. Good beverages, cuz that’s how he rolls, of course. There were candy and spices and tricolored pastas. And, halfway through the night he brought out freshly made insalata Caprese, served on platters of the purest gold! His musical selections were magical and encouraged cross-mingling between guests. I could have danced all night. He also invited an A-list crowd, only the best for Philari. And, lucky for us, all the super A-listers (like, the Brangelinas and Bennifers of Boston) were in attendance. Betsi and Malouk were stunning, Matt wearing North Face and Betsi in a creation of her own design. A my and John arrived fashionably late. That’s when the party TRULY started. Just when I thought the night couldn't get any better, we were honored with a special appearance by the one and only Kate R, who makes every party a pahtay and is the only gal I know who can drink cheap, warm vodka, straight up, without making a face. Phil especially enjoyed himself. The party was so amazing he quietly closed his eyes, then he drifted to sleep on Matt & May's couch. He dreamt about maybe throwing a party, and just how great that would be. We had the best time at your party. Fo real, thanks Matt and May. The newer additions to the team, including the NS folks, were an amaaaazing bunch, and sure knew how to have a fun time. I loved everyone I worked with and was grateful that they waited for me for two and a half hours at the Beehive on my last night in the city because a certain bouncer wouldn’t let me in – to my OWN going away party!!!! Grrr. I won’t forget it! 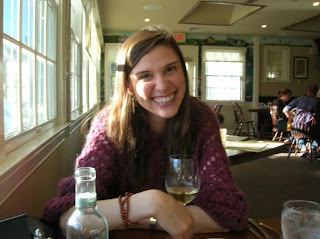 And, of course I couldn’t leave out Ms. Emily, the superstar who has since replaced me at the forum. She is definitely the right person to take SIF to the next level and I’m looking forward to all the SIIC emails to flood my inbox so I can keep track of her and make sure she’s doing her job correctly and not screwing up. Although I am sure that the stellar female SIF team, led my Susan and Mary, will continue to be a smashing success. Speaking of the stellar SIF team, I was able to kill two birds with one stone and have a lovely lunch with Susan, Mary, Julie and Emily while at the same time crossing another restaurant off my list. We ate at the yummy Casa Portugal in Inman Square, Cambridge. I’d been wanting to try this place since I moved to the city since I heard it was tasty and cheap – my two most important criteria, especially for a lunch place. Three of us ordered the carne de porco a portuguesa, marinated pork cubes with fried Portuguese potatoes in a brown sauce, because we thought it looked authentic. I enjoyed the dish and it reaffirmed my belief that I could certainly be a vegetarian if not for the tender meaty goodness of the pig. Another lunch, another valued colleague, another restaurant off the list – Tania treated me to lunch at Asmara, an Ethiopian/ Eritrean restaurant in Cambridge’s Central Square. Tania used to be a regular here so she had some great suggestions on what to order. She highly recommended the Asmara Tibs, tender beef in a spicy red sauce with onions, green peppers and chilies. If you’ve never eaten Ethiopian food before, it’s a nice change from the norm and a great excuse to be messy and eat with your fingers and smear delicious red oily goo all over your mouth and cheeks – on purpose or accidentally. I love the communal aspect of using the injera bread to grab at whatever looks good while chatting away with good friends. Prices are a bit high here for lunch in Central Square, especially since Picante is right next door, and Pressed is right across the street and there are tons of all you can eat Indian buffets in the ‘hood for $6 a pop (Gandhi, Shalimar, India Pavilion), but I’d definitely recommend it if you’re in the mood for something a little saucy (in more ways than one). America, and miso and wakame soups galore. What a feast! It reminded me of the restaurant my Japanese friend Yoshiko took me to in Korea Town in NYC when she was visiting the states this past summer. Here’s a photo of the food from that excursion. 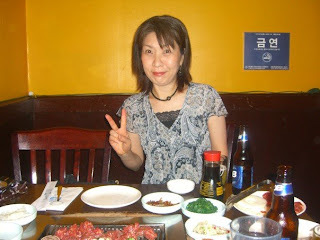 And Yoshiko reminding me that Korean food is peaceful. 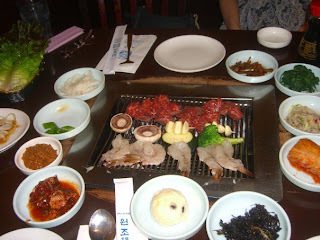 Koreana lived up to my expectations and made me feel like I was right back in Seoul with Lipe! Highly recommended and another great communal place to go with friends, and affordable if you realize you don’t have to order one entrée per person – they definitely provide enough to share. After our bellies were full of Asian goodness we were happy that Susie wanted to seek out dessert somewhere in the area. We stumbled upon a little hidden delight, City Girl Café, in Inman Square, and it was just what we were looking for and more! It pleased everyone, as it has a wide selection of desserts for the sweet tooths (Suz and And) and serves beer and wine for those who would prefer to take their calories in liquid form (obviously, Jackie and Cari). We capped off our girls night out with this fabulous find and I said goodbye to my girlfriends…. Colon open parenthesis. You guys promise you’ll pour one for the homies (homies = Cari) when you have your next gals night out? 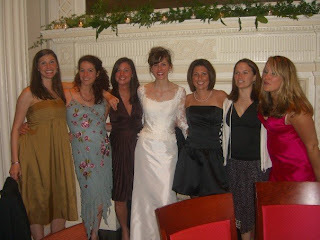 The gals at Aud's wedding. My dining bonanza that night of course wasn’t the only time I hung out with my Jacqueline, Jackie Chile, Jack*, Jacks before leaving. We squeezed in some major hang out time in the weeks leading up to my departure and even sealed our relationship with friendship piercings. Yes, we made permanent our eternal devotion to each other by piercing our noses together at a funky place in Allston called Stingray Body Art – very clean and professional, if anyone is looking to obtain a piercing any time soon. If you look closely you can see the sparkly shimmer of my cubic zirconia nose stud! So now I think of my Jacks every day I look in the mirror, or when I painfully rip out my stud when I’m putting on a shirt. Pain = love, in this case. After our piercings we crossed the street to take part in a Jackie/Cari tradition from the past – drinks and greasy food at The Kinvara, I mean The Draft. We were shocked and dismayed to discover that our hole in the wall haunt at the end of Harvard Ave has turned into… an upscale sports bar?! What?! Clean pool table instead of grimy dance floor? Flat screen TVs instead of Miller High Life banners? Scantily clad promo girls instead of hot buff bouncers from BU? I’m afraid this is a classy joint nowadays, and Jackie and I struggled to find meaning amongst the middle aged men obsessing over the NE Patriots game playing in the background. We found our meaning in the form of buffalo chicken wings and greasy French fries. 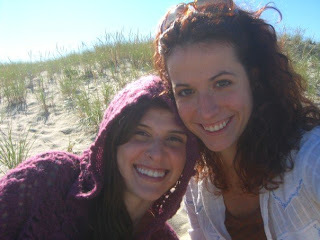 Here we are in Chatham in Cape Cod this fall. How cute are we? We also hung out in less drastic ways. 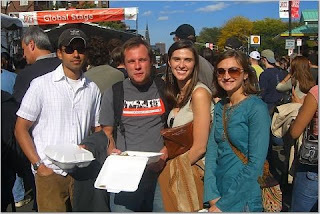 Phil joined Jackie and I for lunch at our FAVORITE restaurant in the ‘hood around our apartment – Woody’s Grill & Tap in the Fenway/ Symphony area. They are one of the few places in Boston with a real brick oven and their pizza is MILES above any other I’ve tried in the city. I mean, there’s really no comparison as far as I’m concerned. They always have a great selection of brews on tap, including some local options, and I love the laid back collegy atmosphere. This has always been Phil’s and my go-to place, and it always hits the spot! We celebrated with pizza and beers (Jackie, I won’t tell your boss) and I of course couldn’t say bye to Jacks just then so we decided we’d meet for drinks the next evening. Meeting for drinks turned out to be buying a magnum of red wine at the corner store and sitting on the floor of our depressingly empty apartment the night before we were scheduled to leave. This was budgetarily and symbolically appropriate for the crowd in attendance; namely, Jackie Phil and me. We’d sold most of our furniture and didn’t have a chair left in the place so we sat on the dirty living room floor (we’d sold our vacuum three days earlier). As luck would have it, we had been unable to sell two mismatched white wine glasses and a martini glass, so we didn’t have to drink our wine out of cupped hands. We of course reminisced about the old days (Jackie is the reason Phil and I met that fateful day six years ago) and planned Jackie’s future trip to Australia (get on it, Jacks!). We all cried a little (except Phil, he doesn’t cry) and said our goodbyes, with Jackie traipsing off into the snowy Boston night with a Dali print under one arm and a blond wig under the other…. 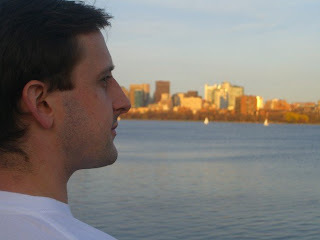 Well, this is the end of the shout outs, and the reasons I will miss Boston. Bye bye. 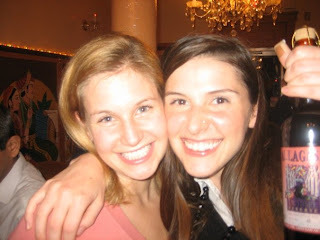 great blog, cari...keep them coming.